Now that we’ve done a few, I have some quick thoughts on them. If you’re logged into the account that created the poll, you can see a running tally of votes which is nice. I’m not sure if this is a better measurement tool than the “RT and Favorite” type polls people have been doing for several years. Voting in polls may be more scientific, but I don’t know if it gets the same reach as the RT/Fav methodology. One area where polls may work better is that you can have up to 4 choices in a poll, not just two in the RT/fav model. In this model, voting is not made public, as a RT/fav is to all your followers. Finally, this post from Buffer has an in-depth guide on how to create a poll on both desktop and mobile versions of Twitter. 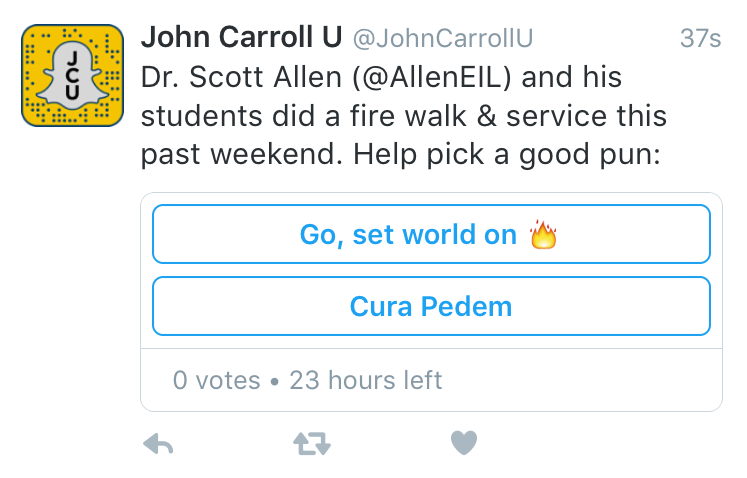 Quick follow-up: So had a few questions about what “cura pedem” means. Both of the items in our poll are very Jesuit ideas. Saint Ignatius, founder of the Society of Jesus, coined the saying “Go forth, and set the world on fire.” You’ll see many Jesuit schools say this to graduates as they leave their campuses.